If you ask me I think on of the best kitchen appliances ever made was the Slow cooker. You can prep your meal in a few minutes and then walk away to get other stuff done just to come back to a delicious meal that is done. Give one or two of these 16 Amazing Slow Cooker Recipes with 5 Ingredients or less a try, you will be glad you did. 1. I LOVE Orange Chicken, this is a great and simple recipe. 2. These Kickin’ Meatballs would be the perfect simple addition to any party. 3. If this Rootbeer Pulled Pork tastes as good as it looks I will be in heaven. 4. Why buy it when you can make your own? Crock Pot Apple Sauce! 5. So simple to prep, I think I will only be making Crock Pot Garlic Mashed Potatoes from now on. 6. These Apple Butter Pork Chops are so making my mouth water. 7. Take an easy dinner and make it even easier with this Slow Cooker Taco Meat. 8. Another favorite made simple with this Crock Pot Macaroni and Cheese. 9. 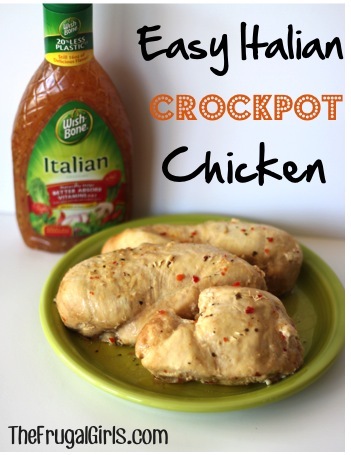 Chicken is my go to for most dinners, this Crock Pot Italian Chicken looks and sounds amazing. 10. You can’t go wrong with this Crock Pot Chili on a cold winters day. 11. 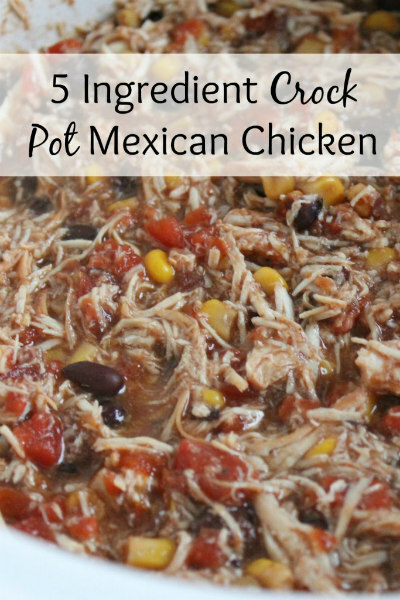 Simple and easy prep and you still get this delicious Crock Pot Mexican Chicken. 12. Pasta is a big hit at our house so I am always looking for new recipes to try. This Slow Cooker Beef and Noodles is for sure on my list of things to make. 13. S’mores in the Crock Pot? My dreams have come true. Now I can eat them anytime I want, no camp fire needed. 14. Need a quick and easy dip for your party or get together? Try this simple Quick Crock Pot Queso Dip. 15. I can not wait to give this Sweet Hawaiian Crock Pot Chicken a try. This is one dish that will be well worth the cooking time wait. 16. Who knew you could make Ribs in the Crock pot? I have got to try this Korean Ribs Recipe STAT. Great round-up…and you’ve added some new ones to my list! Thanks for including my Mexican chicken! Our pleasure, Kristen. Thank you!